Marks, Measures, Maps and Mind is a promenade performance created by Dog Kennel Hill Project, co-commissioned by South East Dance, Turner Contemporary and Stour Valley Arts as part of RELAY, and produced by South East Dance and Stour Valley Arts, August 27. Marks, Measures, Maps and Mind celebrates the physical body through a range of sports-driven tasks, in a breathtaking natural setting. Sporting challenges and actions form the basis for a dance that showcases the human drive for precision and perfection within the wild and epic locations of the forest, rekindling the timeless relationship to our natural environment (from the program). Outside we are formed into two groups of thirty people, each with a guide. It is oversubscribed this evening for the last performance. After a briefing, the two groups merge into the forest like a straggle of pilgrims, some with staffs and walking sticks, some dressed for the theatre, some for hiking. We trek for fifteen minutes through King’s Wood, along a path through the meadow, past the beech trees, sweet chestnut trees, larch and shoulder-high ferns. Little Robin Hoods with their sticks run off into the undergrowth and back, birds sing, and the air becomes danker and cooler and the light more muted as we enter further into the forest. There is no fourth wall in this theatre; there is no wall at all. After fifteen minutes, we turn right and climb a long and grassy path, the final ascent to the beginning of the performance. At a gateway of green string tied between two trees we divide into our groups and enter along the path. In the dappled light we encounter male and female dancers in groups of two or three, dressed in blue and yellow tops with black or white skirts, standing still among the trees on either side of the path, staring ahead, hands open as if we have come across a group of pagans in a solemn ritual. The figures stand out in the forest, sculpting the space with their bodies, though their costumes are too wooly to make their shapes precise. And then they overtake us, running to the next event in energetic disarray. Our groups stop in front of a dancer precariously wedged between the trunk and an outcropping stem of a tree, with two pieces of wood knotted to either end of a green string balanced over her head; as her head moves dreamily from side to side, she resembles the pendulum of a grandfather clock. We move on and the group splits into two, approaching the next event from two sides. In the clearing a dancer with a giant wooden measuring compass creates heroic geometric shapes, pointing up towards the tops of the trees, or at right angles to the ground, while the other two women jump and circle her as wild, dynamic satellites: images of some cosmic drama, a vestige, perhaps, of Oscar Schlemmer’s Bauhaus experiments. We move off down a sloping, winding path of rare natural beauty beneath the forest that dwarfs our movement. We come to a ridge of back-lit trees where two dancers manipulate articulated, rectangular frames that make the clacking sound of folding deckchairs. This is more musical than measuring and insufficiently epic to influence the space. If you put small movement in a forest, it is the forest that dominates. Yet a figure standing still throughout the interlude who suddenly runs off down the hill – a tiny figure running amongst the monumental trees – takes our breath away. We continue our path down, past two performers balancing sticks and come to a turning. A sign says ‘Do not play on the sculptures’, but the sculptures are so much a part of the forest’s natural forms that the sign is our only indication they exist. We are at the bottom of the valley and our guide turns us to look back up the incline to see an impressive array of figures like statues on this vast stage of sloping forest floor. On a shout – the first introduction of any human sound – the dancers run up and down within their delineated space and as suddenly come to rest, their arms marking slowly the four cardinal points. Only the muffled roar of jet engines far above the canopy of trees remind us of the world we have temporarily left. On another shout the dancers flee in all directions, rushing past us and on to the next event. We climb again, a fairly steep climb up the opposite slope and stop before a single introspective figure in white and blue, one knee anchored to the leafy forest floor as she turns slowly with angular arms and arching torso to a faint, watery score that we strain to hear over the brooding silence of the forest. We rustle off in search of our next sighting. 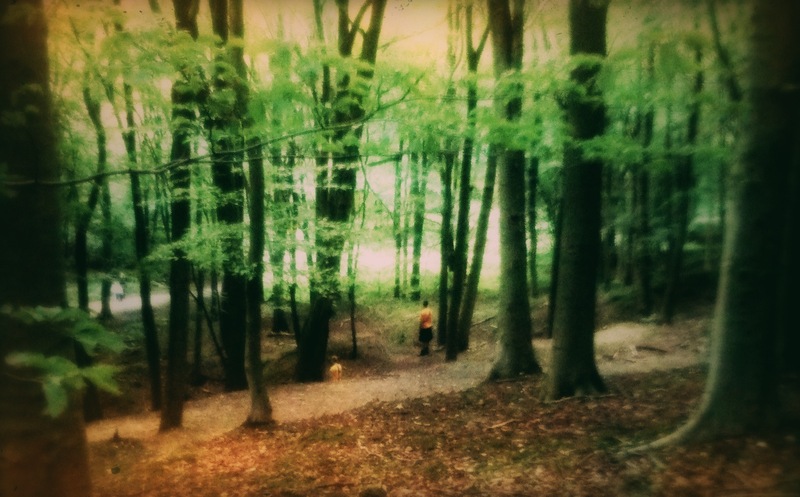 Accustomed now to the stillness of the forest, it is easy to spot a running figure. He is circling round the rim of a crater (this is a sculpture) in which water has collected. A woman perches on the rim balancing a triangular construction of string and sticks, as if she is fishing. The man runs round and comes to a stop opposite her to watch. We meet the other group at an intersection of paths where, in the clearing, two women perform with sticks as extensions of their arms and a giant crossbow-like structure strapped to their backs. They move their extensions like feelers, sensing and searching our invasive presence. They might also be, according to the program, ‘investigating a relationship with space and time through the marking and mapping of points in rhythmic sequences’, but the forest does not suggest such cerebral analysis: the dancers are more like giant insects, who retreat to safety under a canopy of trees. We follow like hunters on the trail of some exotic fauna, now trapped and buzzing, then let them go, and enter another opening off the path, to sit in the bowl of what may well be our second sculpture scooped out of the forest floor with an ordered arrangement of branches and the trunk of a tree. Bird song stands out from the ambient sound as the dancers surround us on the rim, watching us who are watching them. One by one the dancers begin to gyrate their shoulders and raise their heads and arms to the sky in a silent benediction, and then they are gone. As we regroup, we hear them chanting down the path, like a small crowd of victorious football supporters. It is as if the dancers emphasise the nature of the forest by what it is not: trained human shapes, human voices and social activity. We move off again and come to a circle of trees and the sense of a finale. From the slope above us, the array of dancers descend closer to take up new shapes. One girl does a handstand against a tree. The sound of birdsong from the speakers seems extraneous. As they sweep past us to take up positions further down the slope, the dancers lay red sticks at the edges of our group, marking us. Standing with their backs to us they look out over the sloping forest below. We are once again a part of their ritual. Rain begins to fall, real rain; it sounds like distant applause from under the high canopy of leaves. It is the cue for the dancers to move off down the hill, disappearing over the ridge and leaving us with a tiny crescendo of rain that stops as magically as it began. The sound of our clapping in the forest is surreal, bringing us back to the conventions of a theatre. As we humans file back refreshed in mind and weary in body to the starting point, there is enthusiastic discussion of meaning and experience. I wonder what the forest was thinking as it observed the performance: small, animated figures rushing amongst the trees and gesturing, viewed by two groups of figures following at a different rate, but not doing anything: not feeding, not fighting, not sheltering, not growing. Scripted, ordered, unfathomable. Let’s see that again.